You’re going to need a fork to tackle these hot chocolates. Pastry chefs are taking inspiration from mugs of cocoa to craft cakes, puddings, and deep-fried chocolate truffles. Here are six hot chocolate desserts to savor – guaranteed to warm your belly and make your inner child’s heart glow. 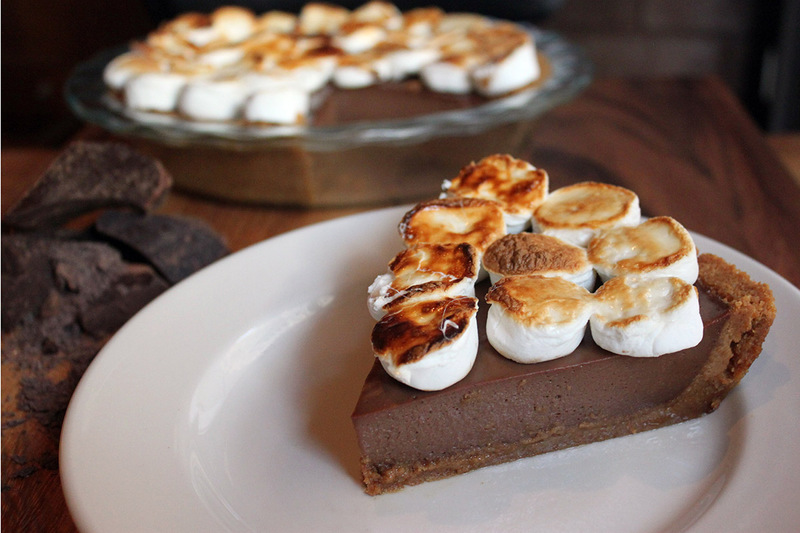 Though this pie is a hat tip to the summertime s’more, it also manages to recall a cold weather cocoa. That’s because the dense chocolate pudding filling is topped off with a layer of lightly torched marshmallows. Unlike the jet-puffed plugs floating on the top of a cup of steaming Swiss Miss, they won’t melt if you don’t eat them quick enough so you can take your time with this superior slice. Make a reservation at Hub 51. Hot Chocolate Cake at Morton’s the Steakhouse, Washington, D.C. 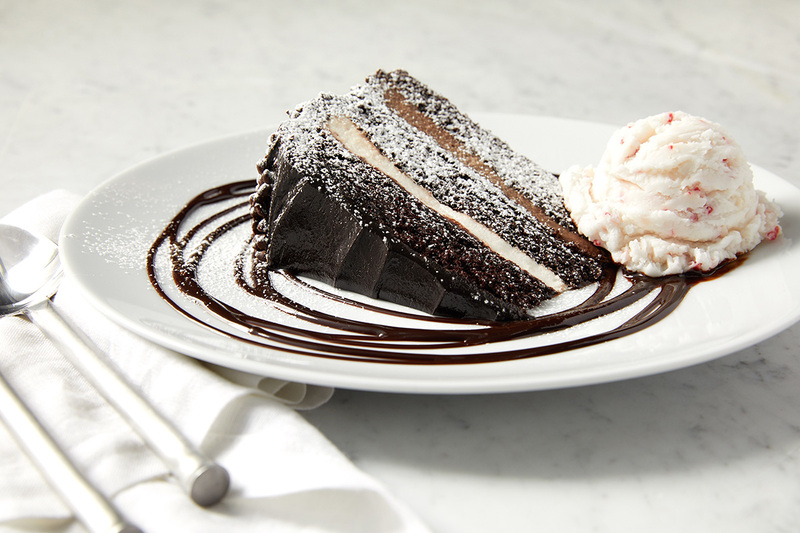 Baked to order, this rich, dense chocolate cake hides a sweet surprise. Cut into it and you’ll unleash a torrent of molten chocolate. A scoop of vanilla ice cream is a cooling counterpoint. Show some holiday spirit by sharing a bite with your dining companion – unless you want coal in your stocking. Actually, this cake might be worth the coal. It’s your call. Make a reservation at Morton’s the Steakhouse. 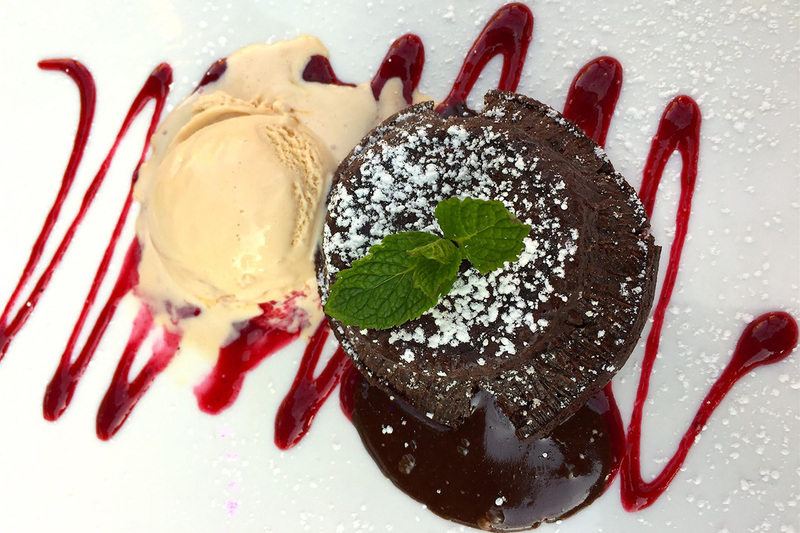 To add Latin flair to lava cake, chef Cesar Guevara incorporates Kahlúa coffee liqueur and orange zest into his flourless dark chocolate cake. Plunge your spoon into the center of the miniature mountain and you’ll be rewarded with a magma flow of molten chocolate. Definitely the most memorable volcano since Vesuvius. Make a reservation at Esperanto. Floating Smith Island Cake at Farmers Fishers Bakers, Washington, D.C.
Maryland’s state dessert – yes, that’s a thing – is Smith Island Cake. It was born on its namesake island in the Chesapeake Bay, some time after the Civil War. One version of its origin story is that wives would send it out with watermen going oystering in the winter because the layers of icing would help keep it fresh. This fancified version sits in a bowl of hot chocolate, which soaks into the cake to add a deeper cocoa flavor. Make a reservation at Farmers Fishers Bakers. Santa would love if you left a slice of this out for him. 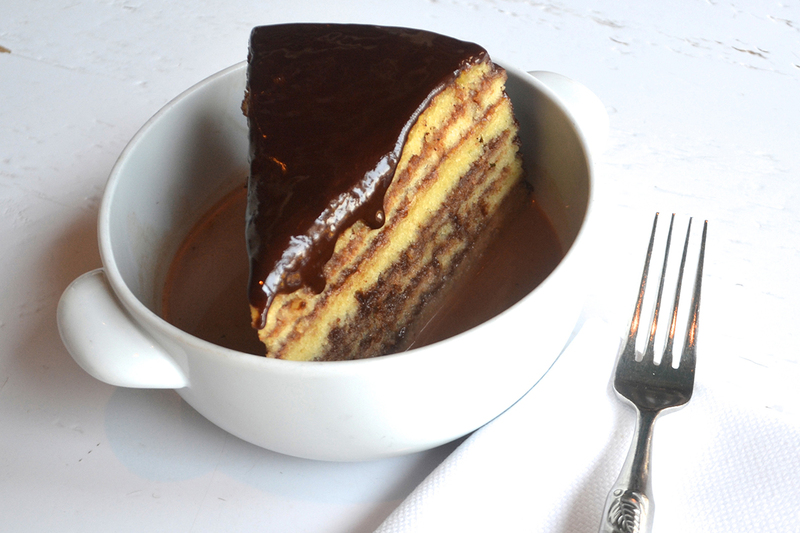 Three layers of dense chocolate cake are held together with generous swathes of milk and white chocolate mousse. A fudge ganache frosting enrobes the cake, adding a fourth cocoa component. On the side, there’s a scoop of candy cane gelato flecked with crunchy bits of the festive candy. Make a reservation at Brio. Shakespeare’s star-crossed lover is given a tasty tribute we’re sure would impress Juliet. A cocoa-coated Dutch dark chocolate is frozen solid before it’s dusted with flour and dipped into crepe-like batter. 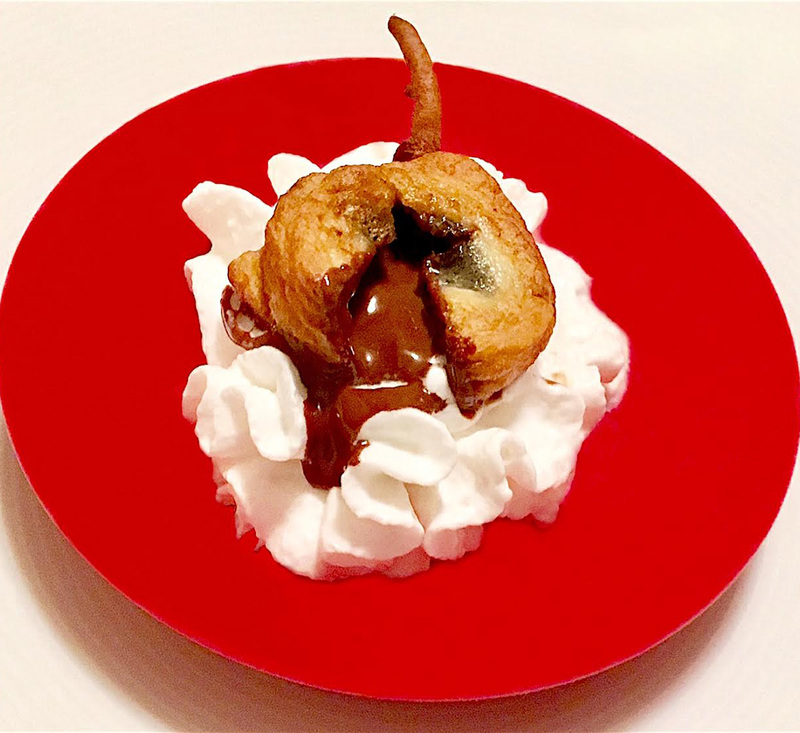 After a trip to the deep fryer, it’s presented on a cloud of whipped cream. Slice into the crispy golden shell and melted chocolate oozes out. It’s a most decadent dessert. After you finish it, you’re likely to proclaim, “Give me my sin again.” Make a reservation at Bettola. Have you encountered delicious hot chocolate desserts on winter and holiday dining menus? Let us know where here or over on Facebook, G+, Instagram, Pinterest, or Twitter. How about the West Coast? 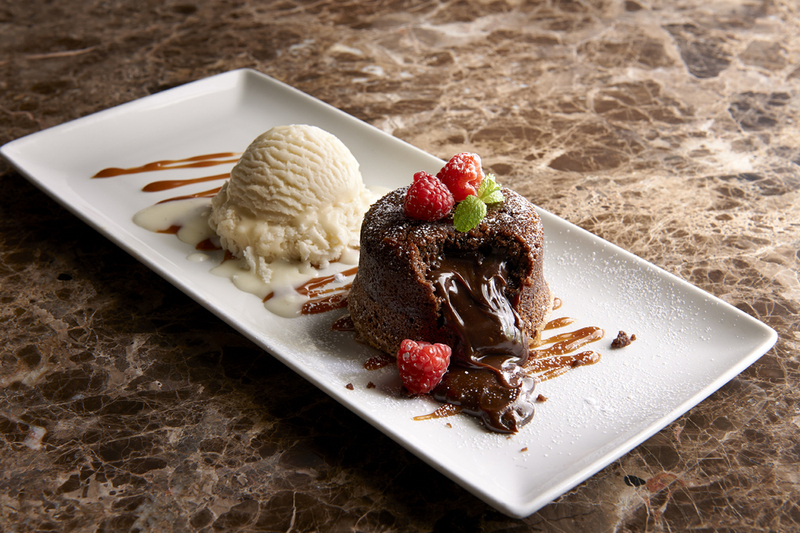 We need our chocolate fix here too!